Amethyst is the Birthstone for February. It is a gorgeous stone that is available in an array of purple tones. Amethyst is one of the most common crystals but is the most highly valued in the Quartz group. Traditionally it has been worn to guard from drunkeness, but today it is believed to have many properties that are beneficial to the mind and body. Amethyst is very popular in the jewellery making world. 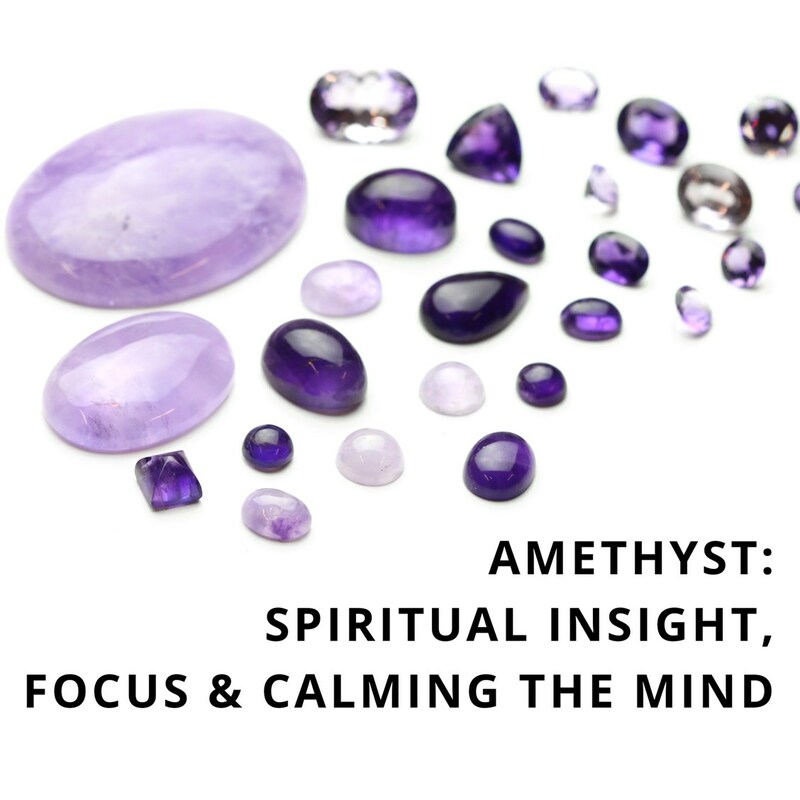 Here we will delve into the history, uses and spiritual properties of Amethyst as well as share some jewellery making inspiration. Colour - Amethyst comes in a variety of shades of purple from deep plum to light lilac. Canadian Amethyst appears more violet, whereas Brazilian Amethyst has more of a slight red tinge. Appearance: Amethyst is a dichroic crystal (showing different colours when viewed from different directions, or, more generally, having different absorption coefficients for light polarised in different directions) that can show a bluish or reddish purple tinge when viewed from different angles. Usually the stone has distinctive inclusions within it. Rarity: A common crystal that is mined in many countries. Moh Scale Hardness - Amethyst measures 7 on the MOH's hardness scale. It often has small inclusions that can cause weak spots within the cut of the stone. These are caused by liquid getting into the canals within the stone structure. Sourced - United Stats, Britain, Canada, Brazil, Mexico, Russia, Sri Lanka, Uruguay, East Africa, Siberia and India. Amethyst is found in alluvial deposits - which is material deposited by rivers where the stream has slowed down. It is also found in geodes - which is a small cavity in a rock lined with crystal or other mineral matter. Amethyst is a transparent stone that grows in the form of pointed crystals. It's purple colour tends to darken towards the top point of each crystal. The stones colour tone is determined by the amount of iron within the rock and can be altered by heat treating, irradiation or with gamma rays. Sadly the colour can also fade in sun light. This stone is the most highly valued of all of the quartz family and has been a popular in jewellery making since the 19th Century. Amethyst is very well known by the ancients as a sobriety stone, worn to guard against drunkeness, and to instil a sober and serious mind as well as assist in getting rid of addictions to alcohol, drugs, smoking and destructive compulsive behaviours of all kinds. The name originates from the Greek language and is thought to mean "not drunken". Amethyst has been used throughout the ages as a calming stone, it is said to be one of the most powerful of the healing stones giving off naturally tranquillising energy. The stone is also thought to promote love and serenity as it is a natural tranquilizer that can aid in blocking geopathic stress and negative environmental energies. Amethyst is thought to be extremely beneficial to the mind - calming or stimulating as appropriate. It is said to help you feel less scattered, more focused and in control of your faculties. Many believe that Amethyst facilitates the decision making process, bringing common sense and spiritual insight. Amethyst is said to boost hormones and tune the metabolism, cleanse the blood and relieve emotional, physical and physiological pains or stresses. The stone is thought to help with reducing bruising, swelling and even treat hearing disorders as well as lung diseases, skin conditions and insomnia. Point towards you to draw in energy, or away to repel energy. For insomniacs, place a piece under our pillow. As jewellery Amethyst is best worn as a necklace over the throat or heart to channel the powers through your airways and blood stream. Amethyst is such a vibrant and beautiful colour that it is an appealing stone to create jewellery with. It's commonality means that is is available in many forms to get creative with! For example, cabochons, faceted stones, briolettes, rondelle beads, chip beads, oval beads, round beads... you get this gist! To shop all of our Amethyst gemstones for jewellery making Click Here. These cute little bracelets are really easy to create and by using our African Amethyst Faceted Rondelle Beads you can create the perfect gift for a February birthday. 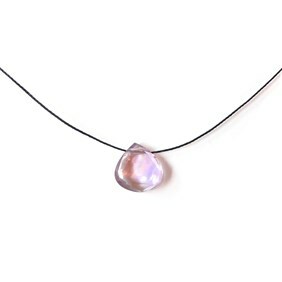 This necklace is a simple design yet looks so effective thanks to the natural beauty of the gemstone briolette. Here wave hung a pretty pink Amethyst briolette on some black Silkon thread and finished it with gold filled crimps, gold plated jump ring & bolt ring. This beautiful bracelet features one Amethyst Faceted Puffed Cube Bead in the centre of Rainbow Moonstone and Labradorite Rondelle Beads. The design itself is very easy to create and the bracelet would look great either on it's own or stacked with others. 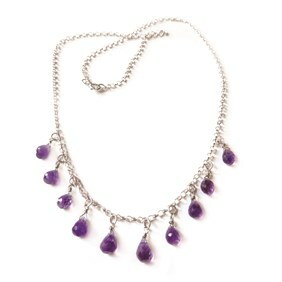 This amethyst teardrop necklace is so pretty. 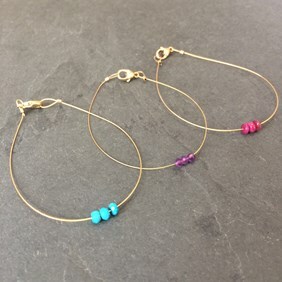 A great project to practice getting your wire wrapping technique looking identical each time! The design really showcases the pretty shade of the purple amethyst briolettes and their facets which glisten in the light beautifully.